Whether it is fire, flooding, infection or any other form of emergency, Vanguard Healthcare can provide immediate solutions to ensure that continuity and patient care do not suffer. Vanguard provides instant solutions that mean healthcare providers can avoid long delays in restoring patient services. The experienced Vanguard logistics team can set up and connect a unit to services such as mains, drainage and electricity, within two hours and be ready to undertake operations within 48 hours. Mobile healthcare units are the affordable solution when compared with procuring the services of private hospitals. They allow NHS Trusts to retain control of patient services and, therefore, maintain control of both reputation and revenue during and beyond the life of the crisis. 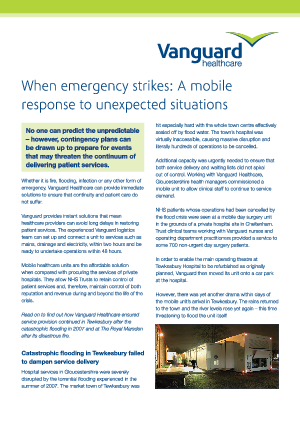 This case study explores how Vanguard Healthcare ensured service provision continued in Tewkesbury after the catastrophic flooding in 2007 and at The Royal Marsden after its disastrous fire.